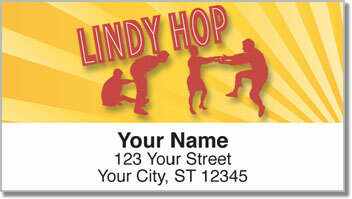 One of the most popular styles of swing dance is called the Lindy Hop. It's believed the energetic moves, which were born in Harlem, got their name from legendary pilot Charles Lindbergh. Maybe it was because you fly with your partner across the dance floor. Or maybe it's because Lindbergh was the first to hop across the Atlantic in a plane. 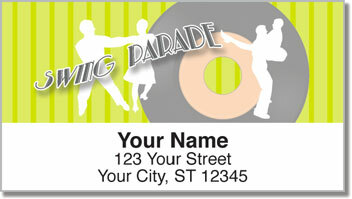 This vivacious label design will add life and personality to your usually boring letters and packages. They also feature other popular dances. It's a finishing touch for your mail that really swings. Plus, you'll love how easy they are to use. A self-adhesive backing lets you simply peel and place them on every envelope. 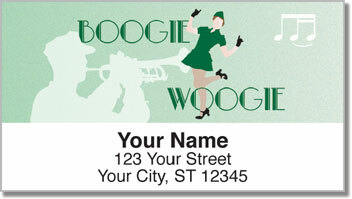 Get your own Swing Dancing Address Labels today! 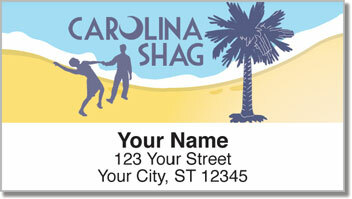 Order matching checks with free shipping to make it complete.